Position:full sun Soil: fertile, sandy, well-drained soil, including alkaline soil Rate of growth: fast Flowering period: June and July Hardiness: bordeline hardy (may need winter protection) The elegant flowerspike of this cultivar is crowded with rusty orange buds opening to peach flushed, golden-yellow flowers. A relatively compact form, it tolerates more exposed positions where it will put on an eye-catching display. 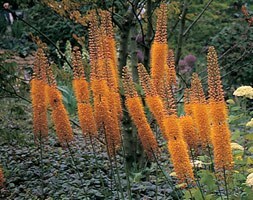 Foxtail lilies need to be planted in fertile but well-drained soil with the crown not far below soil level. They start to grow in late winter and spring, gathering their strength before they produce their towering flower spikes in summer. Each flower spike has hundres of flowers which open from the bottom upwards, creating a stunning effect. They thrive in the sunniest spot in the garden, especially if the base of the plant isn’t shaded as this can decrease the number of flowering spikes produced. Garden care: In September every three to five years carefully lift and divide congested clumps. Replant the strongest crown on a layer of sharp grit, spreading out the roots and covering them with a thin (5cm/2in) layer of soil. In frost-prone areas cover with a dry mulch of fern leaves.